I had a short easy run on the schedule yesterday, so I thought this was a good time to review the Milestone Pod that my sister got me for Christmas. I had no expectations, because I had never heard of the product, but I was excited to try it out. More and more gadgets are being designed to give runners feedback on form. They all sound good in theory, but I had two questions. The first, is the data accurate? Second, is the data really useful? The Milestone Pod’s setup was very easy. You download the app to your phone, and atttach the pod to your shoe. I can’t remember exactly how I told the pod to connect the app, but whatever I did worked perfectly. There is nothing to do after that. You just wear the shoe and press sync in the app after your runs. 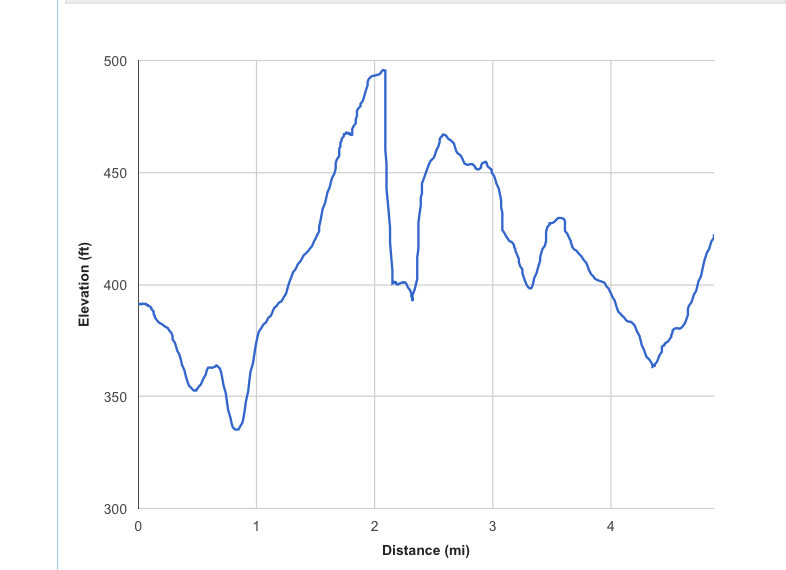 After the first run, I noticed that the distance did not coincide with my Garmin. There was a pretty easy process for calibrating, so I did it. The distance is still off, but it is closer. Yesterday's run had a little bit of everything, including hiking. 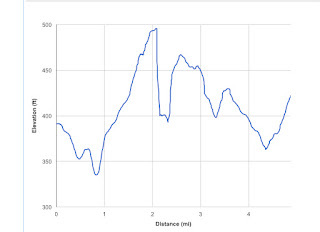 I walked a few downhills and stopped my Garmin. My pace was 9:14. The running distance was 4.93. The elevation chart follows. 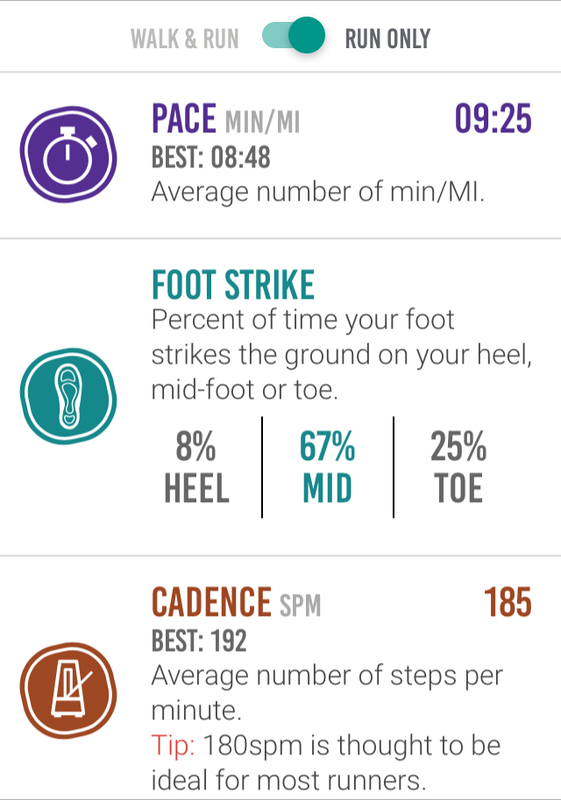 The pod recorded my total distance as 5.04. The distance isn't too far off. Foot strike appeared pretty accurate. If you would have asked me before using the pod, I would have said that I was a forefoot striker (mid-toes). Cadence seems pretty accurate. It tells you that you should be aiming for 180. I know that my cadence is high, and it shows a cadence consistently above 180. I knew that my ground contact score should be poor if the pod worked correctly, and the score wasn't good. The app said that elites were below 200. Exactly what 200 measures, I have no idea, but my score is usually about 221. Today it was 223. I signed up through the app for hints about how to improve. Though the device reconfirmed an area of weakness, but the “hints” are useless. Today's hint was to jump rope. My rate of impact (defined as how quickly force is transferred from the ground to your leg) is consistently regarded as good. Good is defined as “low.” I was surprised that my rate of impact was good given that my ground contact score is bad. My leg swing score is inconsistent. High is better. Sometimes, I’m high. Sometimes, I’m low. My effort to influence the score has no affect at all. You would think that leg swing would be the easiest score to improve, but I’m having no luck. Today, it was high, but that is not always the case. My stride length stays around the same number. My guess is that my stride length is not great, but doesn’t the length of my legs come into play? I’m pretty short. I don’t think the app ever asked for my height. 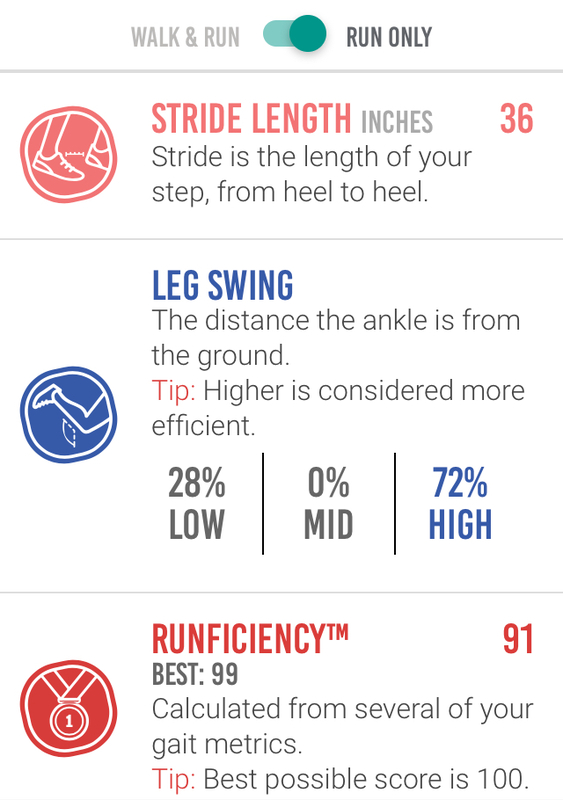 The app does not give a value for "good" or "bad" as related to stride length. It just reports the length in inches. My runefficiency score ranges from 81-92. The app tells me that 100 is the best possible score, but it doesn’t give me a way to value a score of 81 or 92. Today it was 91. There are graphs to look at the data in 6 of the categories over the the course of one run or an average of the past 13 runs. There is also a button to excludes or includes walking. Why would I want to include walking? Either I would want all walking or all running. Overall, I believe that the pod’s data is fairly accurate. How useful it is to me is a different story. I don’t know how to work on improving areas of weakness. I don’t find the hints very helpful. Also, there isn’t much information as to how to put a value judgement on a particular piece of data other than giving you the highest score available. Finally, the pod didn’t tell me much that I didn’t know. I find running data interesting. I like to look at the charts, but I can’t say the data particularly helps me right now, though I can imagine situations where the data would be valuable--like if I were really concentrating on improving some specific aspect of my form or it I had a trainer. When I start my speed work, next week, I'm going to move the pod to my speed shoe and see if there is any difference in the data. A runner who loves data will like this little pod. I like it, even though I'm not sure how helpful it really is.